Ancient peoples worshipped the sun. High tunnel users in the Midwest, Great Lakes, and Northeast (where sunlight can be lacking) do not need to worship the sun; however, they should be familiar with ways in which major aspects of its behavior influence the performance of their crops and structures and, therefore, profit potential. Growers aiming to harvest and market fresh vegetable crops fall to spring (e.g., October to March) in these regions should be especially knowledgeable about the sun’s behavior – in fact, their income depends on it. Natural light entering the high tunnel affects growers directly in two broad ways. First, natural light influences crop growth and other processes, such as flowering and the making and accumulation of pigments and other compounds important to plants and people. Second, natural light is the primary and, often, ONLY source of heat in high tunnels. Anyone who has entered a closed high tunnel on a bright but cold day appreciates the heating power of sunlight. Even growers that employ air heaters or bottom-heating systems rely primarily on the sun to maintain optimal temperatures – after all, sunlight is still free. Daylength and solar elevation may be the most important aspects of the sun’s behavior to high tunnel growers who intend to harvest and market fall to spring. Fortunately, both are highly predictable – a rarity for factors that influence crops and farmers. Daylength data across the year are readily available for many U.S. locations. A plot of daylength by Julian Date at four locations was constructed using publicly available data provided by the U.S. Naval Observatory. This plot reminds us that daylength is predictable and influenced by latitude. For example, over the course of the year, daylength varies in locations such as Kansas City, MO and, farther north, Duluth, MN more than it does to the south (e.g., in Brownsville, TX). Of course, days shorten in the fall and lengthen in the spring but at rates of daily change influenced by latitude. For planning purposes, high tunnel growers can benefit from knowing the daylength patterns for their specific locations, especially if they reside in the mid to upper latitudes. Daylength is only part of the story, however. High tunnel growers may also want to remind themselves of how high above the horizon the sun will reach throughout the year. On the ground, the sun’s elevation influences the intensity of the sunlight reaching the high tunnel and the size, position and persistence of shadows cast by it and other items. Being familiar with solar elevation patterns is useful when positioning a high tunnel and developing a plan for its use fall to spring. Like daylength data, sun elevation data are widely available. 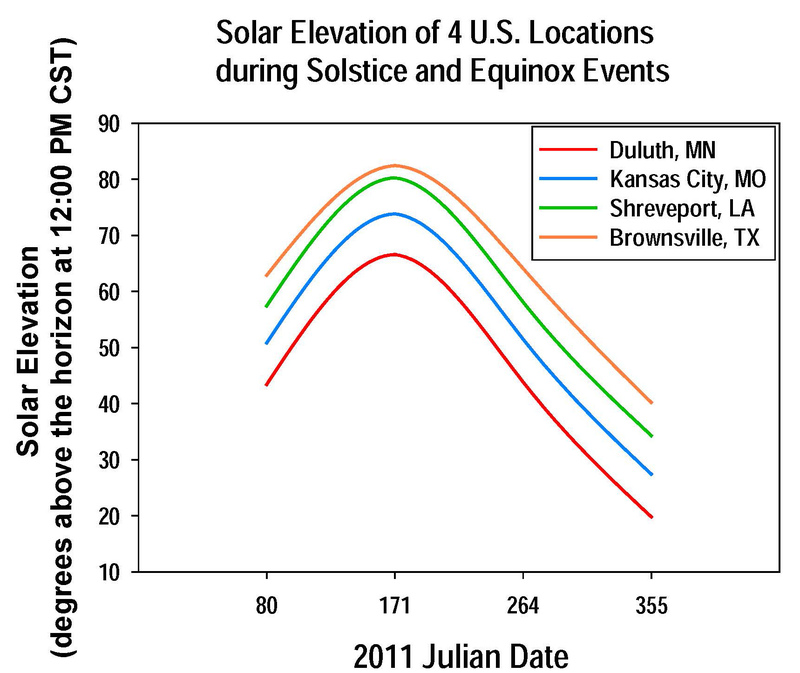 A plot of solar elevation by Julian Date at the same four locations was constructed using publicly available data provided by the National Oceanic and Atmospheric Administration (NOAA) solar position calculator. 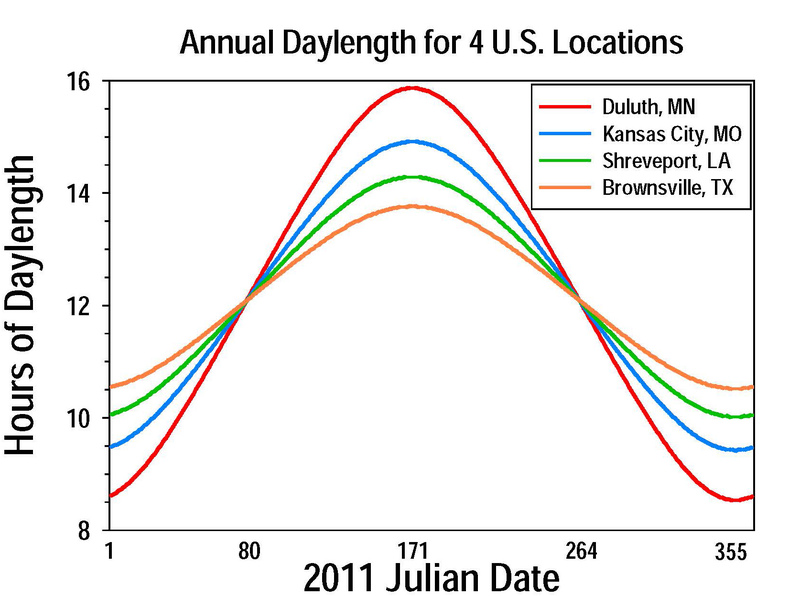 Note that the daylength curves cross (i.e., Duluth, MN and Brownsville, TX trade-off in having the longest day depending on time of year) but that the sun elevation curves do not cross (i.e., the sun is never higher in the sky in MN than it is in TX). Daylength and sun elevation for any given location and day can be known in advance but the cloud cover there and then cannot. Moreover, cloud cover has an enormous influence on the intensity and spectral composition of the light reaching the high tunnel. As outlined in a recent New York Times article, clouds act as barriers, filters, mirrors and blankets. As barriers, atmospheric vapor and particles limit the amount of light reaching below their elevation. 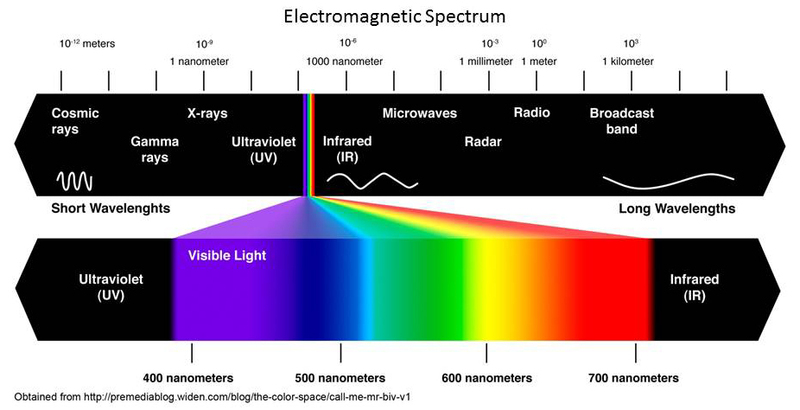 As filters, clouds alter the portion of the entire electromagnetic spectrum that reaches points beneath them. And, as mirrors and blankets, clouds reflect light back to the earth’s surface and retain heat nearer to it. For these reasons, cloud cover is extremely important to high tunnel farmers aiming to market freshly harvested vegetables October-March, especially from farms in the mid to upper latitudes. For example, cloudy days can slow growth and ‘wash’ out leaf color. Global maps provided by the NASA Earth Observatory provide cloud cover images for 2011 while other free maps produced by the National Renewable Energy Laboratory depict average solar radiation data throughout the year for the entire United States. Studying these data and reflecting on conditions typical in various locations helps reveal why wintertime harvest and marketing may be easier for some growers than others, even at higher latitudes (temperatures may be lower but skies are often clearer). That said, growers in areas known for their wintertime vegetable production capacity have also faced very damaging freeze events (e.g., Southwest U.S.). More must be learned to predict the most likely effects of natural light and temperature patterns on high tunnel crops, especially ones grown to be harvested fresh and marketed fall to spring in the mid to upper latitudes. Growers are encouraged to monitor the conditions on their farm and the performance of their crops. Making use of reliable, publicly available technical information is also helpful. Posted by angelo at 9:34pm January 11, 2016 Posted in Extension Spotlight, News. Bookmark the permalink.